We hadn’t been married a year, I guess, when we stumbled across a dying outlet mall near Arab, Ala. (that’s pronounced Aaa-raab, say it slowly) and found a kitchen store that still had a decent amount of stock to sell. We ended up buying a mandolin that didn’t have a lick of English on the package pretty cheap and four soup spoons that cost less than a dollar apiece. I loved those soup spoons. (I know that sounds weird. Bear with me.) 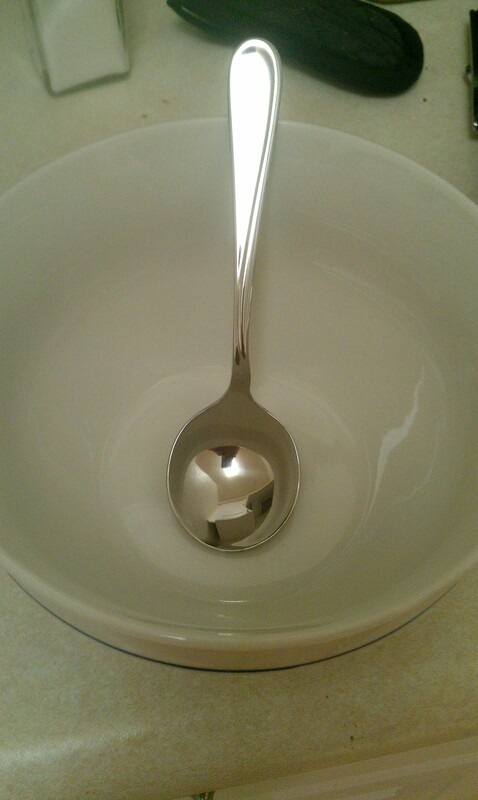 The bowl of the spoon is the perfect shape to bring soup from the bowl to your mouth without leaving any on your shirt. As someone who a) loves soup and b) has spent most of his adult life living and eating alone, that’s really important. I slurp when I eat soup and the teaspoons that come with a flatware set can’t compete. My first experience with a soup spoon came when I was a busboy/dishwasher at The Emporium restaurant in Thibodaux my senior year of high school. We put them in gumbo and soup and I loved how you could eat faster with a soup spoon than you could with just a regular teaspoon. I think we even wrapped them in napkins with the other silverware. I can still wrap a setting of silverware in under 10 seconds, BTW. I had seen soup spoons in dozens of restaurants through the years, but the little shop in Arab (Aaa-raab. You have to say it slowly.) was the first I’d seen them for sale anywhere. Ten years later, when I was on my own again and starting my kitchen from scratch, I couldn’t find soup spoons any where. I checked every kitchen store I came across with no luck. Online searches weren’t fruitful either. So when I got home, I did a search on “bouillon spoons.” Bingo. I even found some on eBay that match my flatware pattern. They came in the mail today. I had soup for supper. None landed on my shirt. She was sitting near the door as we walked into the restaurant’s main dining room yesterday, 38 years older than the last time I’d seen her, but still quite lovely. 38 years ago this month, I was ready to trade in my youth for a life-time at a local fabrication yard, following the family tradition of marrying right out of high school and making a living manipulating metal to meet the needs of a growing family. We reached the first alarm a week before my senior prom. “What are we going to do?” she said after breaking the news to me over the phone. “I’ll be right over,” I replied. There was only one phone in our house and no such thing as a private conversation. My plan had been to enlist in the Army after graduation, but we pulled out of Vietnam the month before and my plans were in flux. Did my country need a commitment from me if we were no longer at war? Did I want to go to college or what? This threw a curve ball at everything. “We’ll get married,” I said as I held her hand. We cried. We cuddled. (Inside, I sighed. Alot.) Doing the right thing is never easy, it seems. In the following week, I sought wise counsel from trusted adults. “You shouldn’t hang around with girls like that,” one mom said. “Lordamercy, boy, don’t do anything stupid,” another mom said. “I can help get you a job somewhere else and she’d never find you,” yet another mom offered. A week after prom, the crisis was over. What was thought to be missing was merely late in arriving. The day after my 18th birthday, she handed me back my senior ring and we went our separate ways. Two days before my 56th birthday, we made eye contact briefly as I walked with a friend to our table in the restaurant. I smiled and did that eyebrow thing that men do, saying “hey” silently. My smile was met with a blank stare. No recognition. No knowing look. No smile. Not even a grin. Nada. I guess things turned out well after all.